4th Annual Arts and Ales | Thirsty Dog Brewing Co. 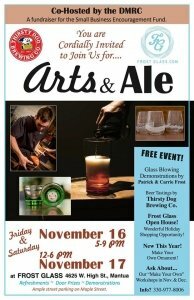 Please join us for our 4th Annual Arts and Ales this weekend! Get your holiday shopping done early, drink delicious beer from Thirsty Dog Brewing Company will be pouring 12 Dogs of Christmas, Blood Hound Orange & Lab Lager. Stay warm in our glass studio while we demonstrate what we do best! Refreshments will be provided by Jake’s Market! Parking available on Maple Street and Village Hall!